i have 2 budgies that are showing intrest in the nesting box, i chose them because i was curious to see the color combination of the chicks if they have any, hoping they will have them. we took the male to a pet store and chose a new female that looks almost identical to the first and after a few months that i let them fly around my room freely they are showing intrest in the nesting box. the female keeps destroying the books on my bookshelf and the male stands around the box and climbes on it while the female goes inside. they've been doing that for a few weeks now. im wondering how long it will take them to lay eggs and what the color combination of the chicks might be and what color are my budgies are offically considered. if you know anything i would appreciate getting some more information. Your budgies are not old enough to breed safely and you need to remove the nest box immediately! It is apparent from your post and the picture posted that you have neither the experience or knowledge to breed your birds at this point in time. For example the perch in the picture is not appropriate for your budgies. Using natural wood perches of varying widths rather than plastic perches or wooden dowel perches helps to prevent pressure sores. I would strongly recommend you put the nest box away and spend the next year getting to know your budgies, their personalities and how to give your birds the best possible care for their health and well-being. You can begin researching the best practices with regard to breeding during this time period. Utilize the Budgie Articles and the Stickies at the top of each forum section. If, after a year you feel you are ready to accept the responsibility of breeding, you will be more ready to do so in a safe way with the least amount of risks for your budgies and any potential offspring. Your budgies are gorgeous but they are MUCH too young to breed. From your post, it seems you are not yet experienced in everything needed to breed budgies safely (being able to tell the correct age of budgies is essential, for one). You should NEVER provide a nest box without having the correct knowledge of how to breed budgies! If you'd like to learn how to breed your budgies for the future, you should start researching now the best ways to care for your budgies and keep them as healthy and happy as possible, and after you know that, how to actually breed them. You've come to a great place to start your research, and we have a lot of people on the forums that are experienced and would be happy to answer any questions you may have for the future. We hope to see you and your budgies around the forums! Last edited by FaeryBee; 12-03-2018 at 07:15 PM. Reason: Fixed smilie - the "wave" was missing the following colon. Please take to heart the advice above... Talk Budgies is a forum dedicated to the best practices for budgie health and wellbeing. Putting a nestbox in with a random male and female, is considered an old practice, and is not the best for your birds’ health. Experienced ethical breeders take much into account and undergo much preparation before selecting an appropriate breeding pair. Please remove the box at this time, and stick around to learn all about the most up to date practices in budgie keeping . From diet, to housing, healthcare, behavior, etc. Please read through all the Stickies and Articles provided on the forum. You’ll find interesting info, as well as answers to questions you may have. i tried to reserch a lot about how to breed budgies and i tried to follow what it says, i let them fly freely around my room and they dont sit in their cage, its simply easier to take good pictures if they're inside, i tried feeding them extra things, they dont eat it and they just fly around all over, i gave them bath water and nesting material and things to chew on other than my books. they dont sit on a plastic perch all day, they have plenty of surfaces to stand on. If the male is 6 years old then he is too OLD to be bred. The youngest a bird should ever be bred is 12-18 months and budgies 4 years old or older should not be bred. As indicated in my previous post, you do not have the knowledge and experience necessary at this time to breed your birds. By trying to encourage the birds to breed, you are not following best practices and are putting both the birds and any potential offspring at risk. That course of action goes against everything this forum stands for. Last edited by FaeryBee; 12-03-2018 at 07:15 PM. Your pied "female", although beautiful, still has her "baby bars" on her forehead indicating that she is likely less 6 months old or less, much too young to consider breeding. Breeding is a lot more complicated than many people consider, and this web-site provides the most up to date information on "everything budgie". As mentioned above, you do not have adequate knowledge to breed budgies. This is not intended as a slam against you, but it’s evident from what you’ve posted so far, as well as your profile saying “newbie”. What is your reason for wanting to breed them anyway? Responsible breeding of animals takes more experience than you can learn by just reading how to do it and researching for a little while. While budgies are prolific breeders, it still takes a great deal of experience to breed budgies properly. There are so many things that can go wrong unexpectedly. “Experience” also means that you know the species inside out, in terms of characteristics that have nothing to do with breeding. This can take many times take years. Slow down, and just “enjoy” your budgies. It will be a lot less stressful for them and you! 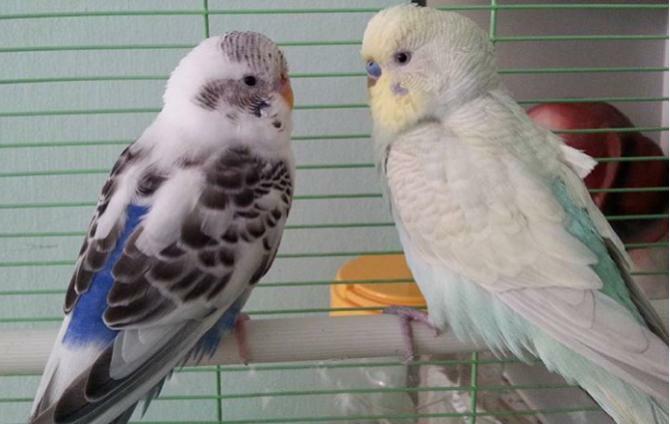 Your pied budgie on the left needs to be seen from the front view to tell you whether she is a dominant or recessive pied. She’s opaline, and I’d say violet cobalt. The male I can’t tell you the entire mutation, but he’s sky blue yellowface. A mutations expert should be along shortly to tell you the details of the mutation. Meanwhile, we’d need a frontal photo .